Before I write 90% of my blog posts, I do a bit of research. I look at other blogs, and see what other opinions are being let loose on the world wide web. I Google the topics I am writing about, anything from Reasons to Live Young to Why I Love Chick Flicks. It's important to me that I'm original with what I write, I don't want people reading this blog and thinking 'Oh, same old same old'. Because that would be boring. But today, when researching for this blog post, I was met with hundreds of thousands of pages knocking this viral selfie craze where women wipe their faces clean for cancer. And despite feeling slightly hypocritical as yesterday I myself had my doubts, I will come out and say I think all these blog posts are just not right. And here's why. Last night, I was browsing through my Facebook and every other picture was that of a bare faced girl, with the title 'Raise Awareness for Cancer' and then, in between these posts were those who were trying to be self righteous, claiming 'Why don't you just donate to the charity', or 'Keep your make up on and donate, then we don't have to see your ugly faces' (two genuine quotes from my timeline). But the thing is, this new craze is not just about raising money. It's also about raising awareness. And that's something people are not understanding. I am 18, and have lost two grandparents to different types of cancer on either side, as well as my own Mum being diagnosed and beating it when I was 10. Yet despite the clear impact the disease has had on my own life, I will be the first to stand up and admit, unless I hear something on the news or on a television programme, I don't give cancer much thought when going about my daily life. Whilst I don't think I, or anyone else, should live in constant fear, I definitely believe we should all be more aware of the disease. If this campaign makes just one person check themselves for lumps, then it is doing its job. And I know for a fact, millions of women (and men too) will be thinking about the disease over the next few days. Last night was a typical Wednesday night, but I am willing to bet between the Facebook friends on my newsfeed alone, over £200 was raised for Cancer Research. So imagine the surge of donations throughout the nation over the last 48 hours. We all know society (including, according to my Facebook and Twitter feeds, a lot of men), want us to keep our faces beautiful by whatever means possible. Make up, plastic surgery, lotions, lasers. If your skin is tight and your complexion is blemish free, you will get compliments. But this craze is having the opposite effect. Personally, being the sole laziest human on the planet, I don't always wear make up anyway. I myself bared as a means of supporting the charity rather than a 'Hey look at me, I'm make up free!' But plenty of girls and women, are not as comfortable in their own skin and for them it's an extremely big deal. Whilst I don't think these compliments should outshine the main cause, I personally believe anything that raises awareness for cancer and also tackles female insecurity, is something that should be applauded, not shunned. Very little positivity comes from viral crazes. We've had the planking craze and the photo bombing craze, and only last month teenagers were losing their lives to 'neck and nominate'. So why, when we are finally putting our obsessions to post selfies and constantly communicate to good use, do people feel the need to knock it. The same people who are condemning have no problem with writing ambiguous status' about their bra colour and moving to foreign countries of getting tattoos in support or cancer research. The selfie is obvious, and it's current. 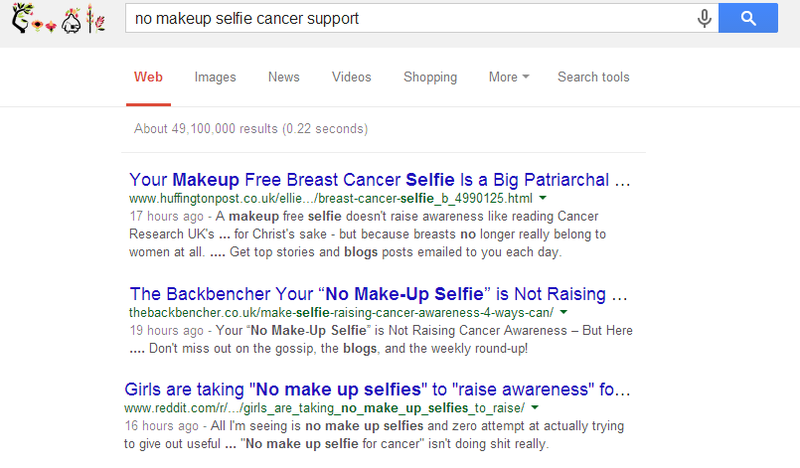 And I'd much rather see it used as a means to support a charity than a way to promote the 'duck face'. So here's my No Make Up Selfie. And I nominate every single person reading this. People are being so negative about this movement for awareness and I just don't understand why because all it's doing is good and I've seen so many people post their no make up selfies along with a donation so I just don't understand the negativity. Fab post! I really love what is going on with the awareness and everything, but I feel like some people are just using it to post a picture of themselves which completely takes away from what some people are trying to do. I think that's essentially where the negativity comes from. I hated that people were posting pictures of themselves claiming to be trying to 'raise awareness' when they clearly weren't even donating or posting anything about donation. But since then, people have been posting with donation receipts which I think is fantastic, and you can't deny the fact it's getting people donating. I'm thinking of trying out something similar for The Lullaby Trust soon, haha. Great post though Alice, your writing improves all the time.